We have finally come to the end of the adventure. Tomorrow we take the morning ferry from Paroikia to Pireaus and catch the Metro into Athens. This morning, before the sun rises too high, we drive to Naousa Bay to explore Koukounaries (pronounced koo-koo-nahr-yes), perhaps the last of the Mycenaean strongholds. We opt for early morning because the fortress is at the top of a rocky, granite hill rising about 75 meters above the seashore. 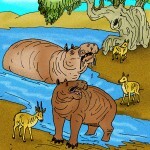 It can become very hot by mid-day. We drive around the bay, turn south onto a narrow country road, and park on the shoulder near a sign pointing to our destination. So up it is. We pull on our hiking boots. The hike to the top of the acropolis is a scramble over huge boulders and along narrow goat trails (occupied by goats who are displeased by our intrusion). At the top we can see large cut rock fortifications along the southern approach, as well as the stone foundations and walls of the manor house occupied by the ruling family. 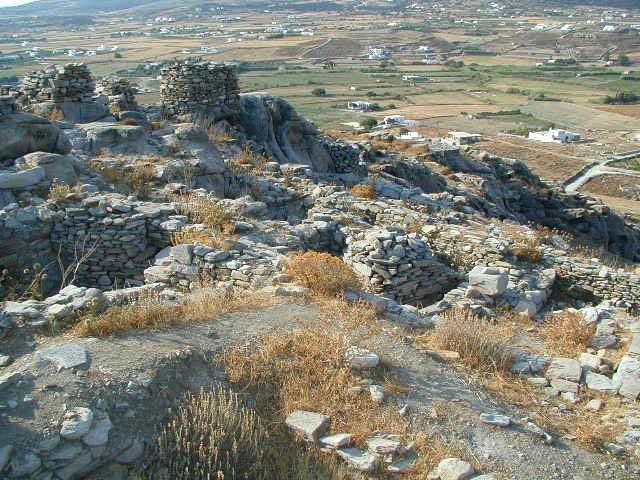 On the north side is an unending view down the rocky battlements to the sandy beach of Kolymbithres, across the bay to the port of Naoussa, and beyond to the nearby islands of Naxos and Mykonos. 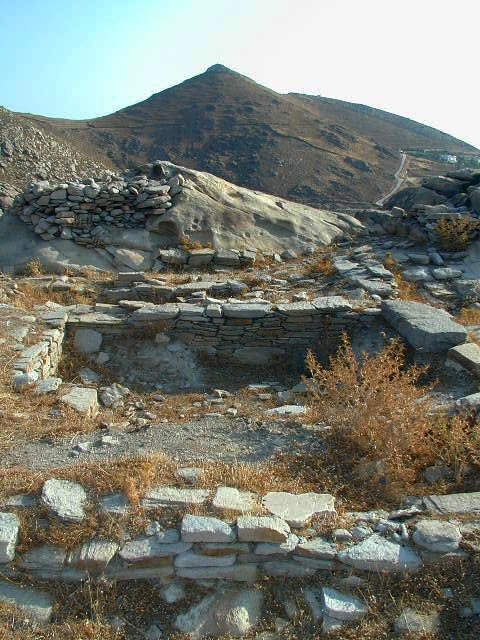 Here was one of the last refuges of the Mycenaean tribes, after their mainland cities had been sacked during the final days of the 12th century BCE. Some chieftains managed to escape with a few survivors, and they sailed to islands in the Aegean Sea, hoping the invaders would not follow. It worked for a time. 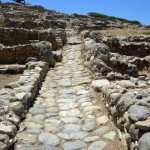 The islands grew strong and prosperous under the leadership of the last Mycenaean kings. 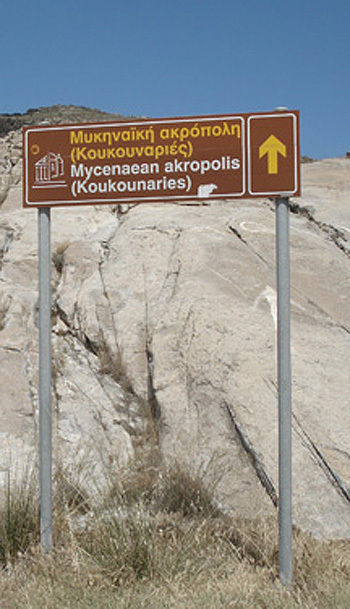 Studies at places like Koukounaries indicate that the demise of Mycenaean civilization was a gradual process, spread over perhaps 150 years after the destruction of the great palaces. 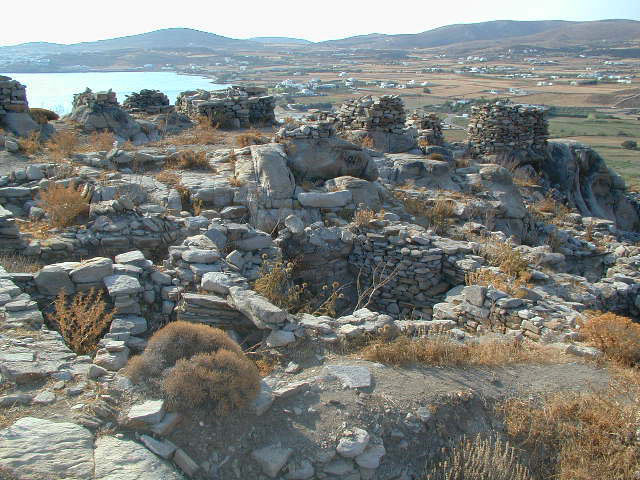 The regional palace economies that characterized the Late Bronze Age were replaced by isolated village cultures trying to survive. This continued for hundreds of years, even into the Classical Age (480-323 BCE), when city states (not regional governments) emerged. 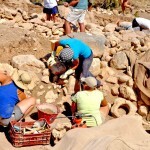 Not until the Hellenistic period and the regional campaigns of Alexander the Great, did cultural uniformity (which typified the Mycenaean period) reappear in the Aegean. Here at Koukounaries, however, it all came to an end when raiders came from the sea, grabbed everything they could from the surrounding farms and villages, and laid siege to the fortress. It must have been a long and difficult fight, because the fortress would not have been easy to take. Eventually the raiders must have been able to torch the wooden beams and upper floors of the buildings (archaeologists have found evidence of a fire). Then the defenders were fighting a losing battle, and their wives and children were trapped in the burning structures (skeletons were found during the excavation). 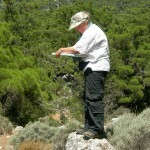 And so Koukounaries – one of the last Mycenaean outposts – disappeared into the shadows of history. 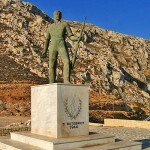 I visited Koukounaries in October 2011. As you said, it was a steep and tough climb, and the path was not easy to follow. 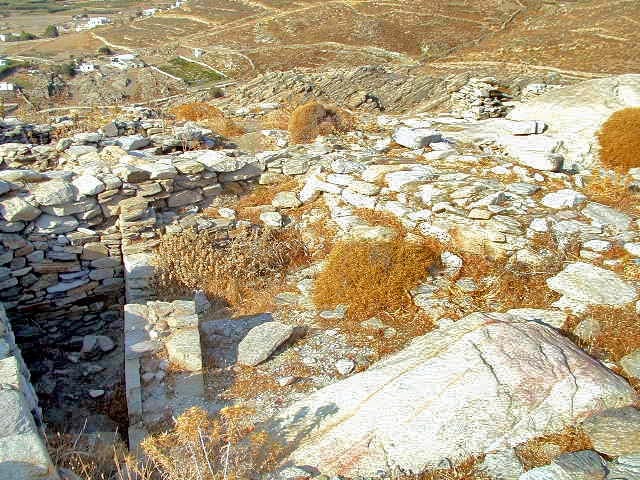 Mycenaean stone walls and structures were hard to distinguish from recently built goat enclosures, except for the obvious large stones at the top.